Stellar Four: Is Harry Back? Tomorrow's edition of the Daily Mirror advertises the story like it's very real. Unless you've been living under a rock (or, you know, were turned into one by a basilisk) you'll have heard J.K. Rowling released a new Harry Potter short story today. It's headlining all over the news. 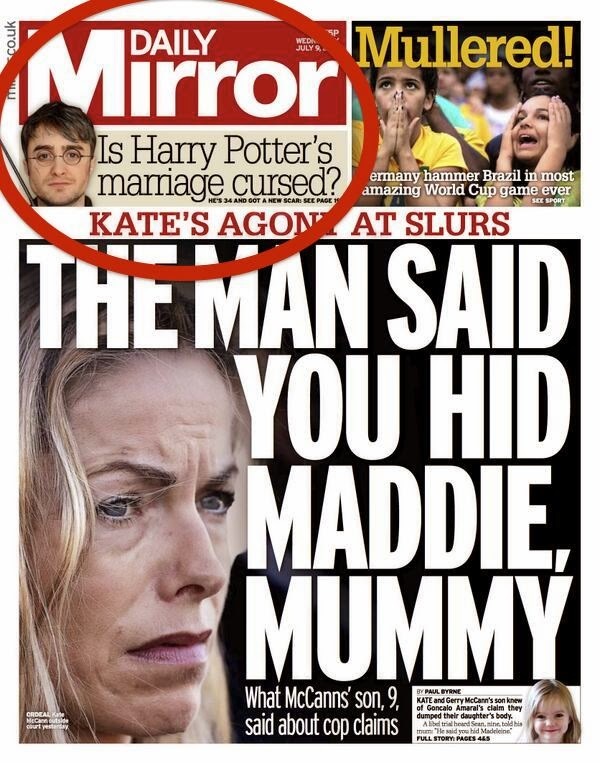 So much so, the Wednesday edition of Britain's very real Daily Mirror looks like a copy of the wizarding world's Daily Prophet. Published concurrently on Pottermore and Today.com, the short, written in the voice of gossip columnist Rita Skeeter and her poison pen, mostly rehashes what we already know but hints at something more. "Potter is sporting a nasty cut over his right cheekbone... Is the Chosen One embroiled in fresh mysteries that will one day explode upon us all, plunging us into a new age of terror and mayhem?" It also mentions the release of Skeeter's latest book on Dumbledore's Army and a very famous date. "And for those who want to know exactly how imperfect they are, my new biography: Dumbledore’s Army: The Dark Side of the Demob will be available from Flourish and Blotts on July 31st." While my nerdy Potter posse from back in the day doesn't think there's much to the two lines, I'm not so sure. Rowling has often done something special on July 31st (it's both her and Harry's birthday) so the mention of the day should make us immediately suspicious. The author also hides big hints of story lines-to-come in seemingly throw away lines. According to my local news, Rowling said she has no plans for a new Harry Potter novel, but that doesn't preclude other options. We know that a movie based on Fantastic Beasts and Where to Find Them is in the works. Could she be working on another Harry Potter film as well? What do you think? Post your theories in the comments below.